Well, what can I say. What an amazing day; one I will never forget. I never imagined when I began mountain bike racing, some 14 years ago, that I would become Alberta Provincial Champion. The provincial jersey is a hard one to win. All the guys lining up want to win it just as much as the guy next to them, and I was no exception. I really didn’t have much in the way of expectations for this season with the arrival of my daughter in May as my priorities definitely lied elsewhere. It’s been a balancing act all season long thus far of trying to squeeze the training in here and there when I can, while staying relatively lean and fresh. Sometimes less is more, and certainly that is the case towards my preparation this year. I had a look at the calendar, and given my baby girl’s due date, I figured I might be able to piece together some decent preparation to be ‘at my best’ for Provincials. The course really suited me well this year. Lots of twisty-turny single track that’s tough to ride at high speed with just enough climbing to keep everyone honest. Torrential rain on Friday created some question marks regarding the course, but Kirk and the Pedalhead crew did a great job selecting the track as there was minimal water logged sections and course conditions were near ideal. From the word go it was ON! I had trouble clipping in and I had to take a few pedal strokes without being clipped in but I finally got pedal engagement just in time to see and hear Bunnin’s chain explode half way up the climb. Quickly my attention turned to Sam who was charging up the opening climb. Yup, we were playin’ for keeps. I managed to charge my way to second wheel and happily followed Sam’s wheel around the opening 1/2 lap as we stretched out a gap behind us. I was feeling pretty good and rolled up past into the lead on the back side ‘stair’ climb and led us through the back half of the course. Manrique was boss on the mic! Each time I lapped through I was so jacked from his enthusiasm. Second time up the feed zone climb I got a little bit of a gap so I put a bit of pressure on without pushing too hard. It seemed to be a well-timed effort as I slowly pulled out a gap. In an attempt to stay focused, I tried to kept my mind on the task…”smooth through the next corner, power up to speed, stand and hammer”. Anything to keep my mind off winning the jersey before the race was over. 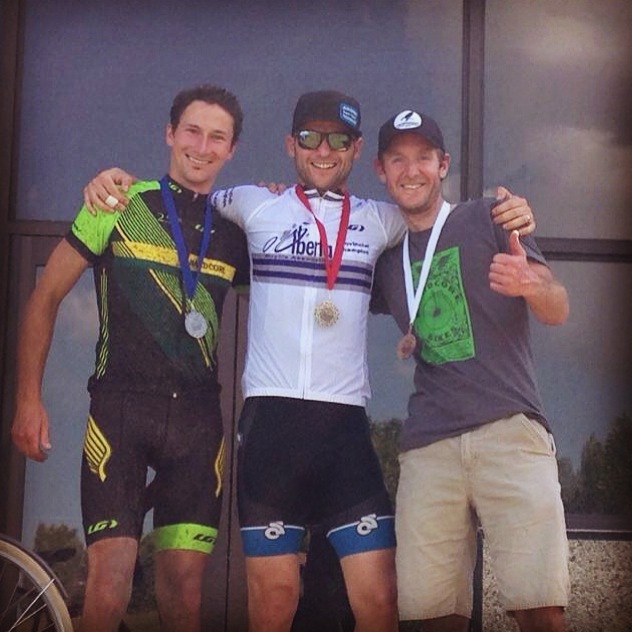 Men’s Podium: Paul, Mike, & Mike – All Dads! Behind me, Paul had moved his way up into second, and had me in his sights. He wasn’t going to back down that’s for sure – especially when the jersey is on the line. Luckily I had played out my race plan and kept my pacing in check so I had some left to crack open the throttle a bit on the last lap. Every climb I punched, accelerated out of every corner, and stood up on each little rise. I had just enough of a gap coming up to the finish line to really take it all in and relish the moment. The best win of my racing career. A wave of emotion came over me after crossing the line. 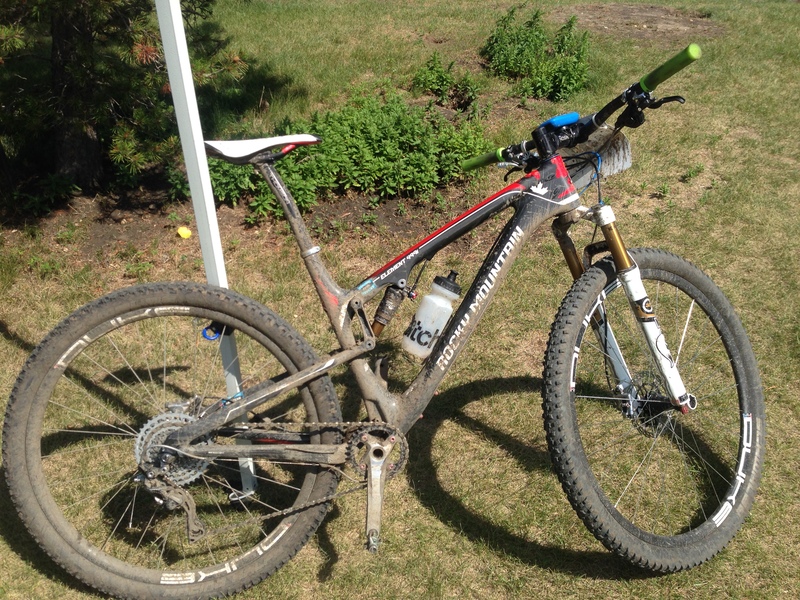 A chubby kid like my with not one but two bum knees is the fastest mountain bike racer in Alberta for 2014! Jersey, Hardware, Winning Bike, Winning Team! Thank you to Pedalhead for committing to host Provincials for the second year in a row and for doing such a solid job. It means a lot to hear me described on the mic as “one of the nicest guys around”. Thank you to Brad and Steve – your support in the feed zone really helped by taking the stress away as I knew I’d have what I need from you guys. Thank you to Blaine @ Labatts for trusting in Sheldon and I enough to take a chance on the team. Thank you to my Kokanee Redbike teammates – always positive, supportive, and fun group of people to hang and race with. Thank you to Brent and Redbike for believing in my vision of Kokanee Redbike and for supporting me and the team these past couple of years. Thank you to my buddy Derek for supporting me with tricked out wheels and more importantly believing in me with the hours of positive talk. His last minute words of encouragement on the start line gave me the confidence to get out there and give it my best. And of course thank you to my beautiful wife Liesje, the wonderful mother of my daughter, who has spend countless hours standing in hot, wet, bug infested feed zones supporting my racing out of pure love. With you I celebrate this achievement.